are circumstances where such a strategy makes sense. IT teams should consider a multi-cloud strategy when they need to ensure service reliability, meet privacy requirements, incorporate more flexibility or optimize their use of cloud services. Organizations first started using multiple cloud services because they were uncertain about the cloud's reliability. They wanted to protect against data loss and ensure business continuity in the event of disaster. Even if a cloud provider offers data centers across multiple regions and can ensure a secure level of redundancy, the possibility still exists that an event, such as a zero-day attack or a rogue employee incident, could impact the data at a global level. Organizations that store data in the cloud should have a disaster recovery strategy in place that ensures against the loss of data critical to business operations. Although relying on a single provider with data duplicated across multiple regions is better than no redundancy, multiple services reduce risks even further. IT teams should think hard about using a single provider to store all copies of their data. Even if an event doesn't result in permanent data loss, service providers can still experience a temporary disruption in services. All it takes is a few hours of downtime to affect operations. By implementing a failover strategy across multiple cloud platforms, an organization can more easily keep applications running and employees productive, regardless of what types of disruptions occur. According to RightScale's 2017 State of the Cloud Report, 85% of enterprises have a multi-cloud strategy. Organizations hosting data in the cloud are subject to industry regulations and policies that govern how and where private information can be stored. For example, some countries require that data be physically contained within that country or region. An organization that offers global services might have a difficult time finding a cloud provider that can meet the data sovereignty requirements across all regions. A multi-cloud strategy lets an organization meet these requirements on a case-by-case basis, while remaining flexible enough to address changing rules and laws. If an organization is locked in to a single vendor and regulations change, the migration can be difficult. However, if the IT team has already implemented a multi-cloud structure that supports flexible data migrations, switching to a new provider is much less painful. Organizations with privacy concerns can also use a multi-cloud environment to break up sensitive data and distribute it across multiple platforms. For example, you can use erasure coding to break data into fragments and store it across different locations. In this way, no single cloud service has a complete copy of the data. Even if a provider's data center is breached, the attacker cannot read sensitive information. Avoiding vendor lock-in is a primary reason organizations turn to multiple cloud services. IT teams that get locked in to a single storage platform can have a difficult time moving data and applications to other platforms once they've committed to a single infrastructure. A multi-cloud approach leads to increased flexibility and less reliance on any one vendor, while offering greater portability among heterogeneous environments. Moving applications and data from one cloud to the next -- or even from on premises to the cloud -- is much simpler and faster with a multi-cloud architecture in place. Having this type of flexibility also makes it possible to respond quickly to changing or temporary business requirements. For example, it's easier for an IT team to accommodate unexpected demand for increased storage capacity as a result of a new sales campaign or to provide temporary resources for one-off projects, such as testing a new analytics offering. Cloud providers' subscriptions vary depending on resource usage, application types and other factors. Organizations that implement a multi-cloud strategy can take advantage of the most cost-effective services available based on their storage and workload requirements. They can also gain performance advantages with multiple cloud services. For example, an organization can choose providers based on where their data centers are located, making it possible to host applications and data nearer to the users accessing them. In addition, some providers might be able to address specific storage and application requirements more efficiently than others, offering better performance for certain workload types. Using multiple clouds makes it possible to choose the best performing platform based on current needs and available services. 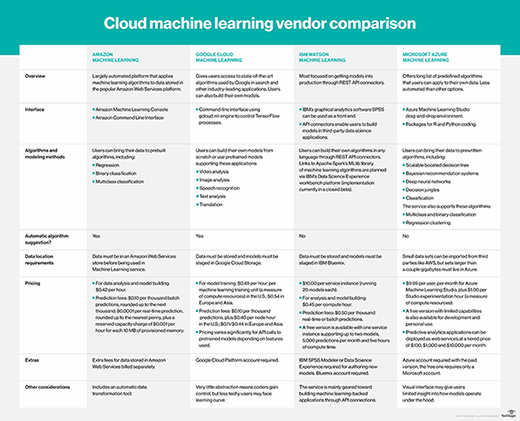 How cloud machine learning vendors compare across interfaces, algorithm methods, data location requirements, pricing and other aspects. Cloud providers also vary in the types of features and services they provide. Some might offer better business intelligence and machine learning capabilities, while others might provide better storage options across more regions. A multi-cloud strategy allows you to use the cloud provider that offers the best service for a specific need, without having to settle for one service that provides only adequate capabilities in several areas. If you want to get the most out of your cloud services, you should give a multi-cloud approach serious consideration. That way, if one cloud platform doesn't meet a specific need, you can move to the next platform. But a multi-cloud setup isn't always the right answer. Implementing an effective multi-cloud strategy is no small task, and an IT team must have the resources and expertise necessary to ensure that all the pieces fit together neatly and securely. In addition, there are benefits to using one cloud provider. A large provider can offer certain discounts for using multiple services that you may not be able to get by spreading your services across providers. Also, having one provider lets you have a centralized management console for all services that isn't yet available across multiple clouds. Even so, using multiple clouds offers clear advantages for businesses of all types. 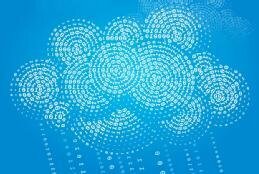 Using multiple clouds can help ensure reliability, protect privacy, remain flexible and optimize the cloud experience. How could your business benefit from multi-cloud services? Intentional fragmentation / erasure coding is a practical way to mitigate loss of data. It also stands to reason that one could use a DR strategy to replicate databases over SD-WAN using multicloud. Lastly, affinity comes into play for geographic solution to latency for international customers.